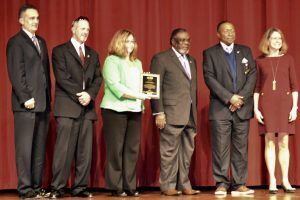 NCSBA presented its prestigious County Commissioners of the Year Award to the Franklin County Board of County Commissioners. The group was recognized during the awards ceremony of the Association’s 48th Annual Conference for Board Member Development in Greensboro on November 14. The Franklin County Board of Education touted their county commissioners as a group of men and women dedicated to the success of their community’s students and teachers. Their leadership, support, and cooperation with the board of education have played an important role in increasing student proficiency and achievement and ensuring that vital school improvements are possible. The County Commissioners of the Year Award is given to a board of county commissioners that is nominated by the local board of education in recognition of their extraordinary efforts.